During January the Braer, one year after its 20th anniversary, was on everybody’s lips. Not because of any concerns regarding a possible repeat of that disaster, but because this January has reminded many of the dreadful January of 1993 when “there was never a dry day and the wind never died down for more than a few hours”. The first half of February hasn’t been much better, but I’ve managed to get out into garden once or twice without getting blown of my feet…because they were firmly stuck in the mud. The descendants of those gales that emulsified and dispersed the oil 21 years ago have felled one of my favourite trees, a 30 year old blackthorn (Prunus spinosa), wreathed in white blossom each and every March. It’s a species known, even dreaded, for its suckering habit, creating so-called “spinneys”, thickets that spread far and wide. Mine broke with tradition and grew into a noble, multi-stemmed, dark-barked tree without as much as a hint of an under-storey. It took the best of a day to cut its trunks into manageable length and restore the root-plate to a (more or less) vertical position. The wood is exceptionally hard, used for turning and fashioning into walking sticks; it burns slowly and gives off fierce heat. The gale that had felled it was no more ferocious than many it had survived over the years, perhaps even less so. So what caused its demise? The lawn is squelching under my feet, the path from the front door to the gate has been under water for weeks and every slope in the garden has turned into a mud slide. 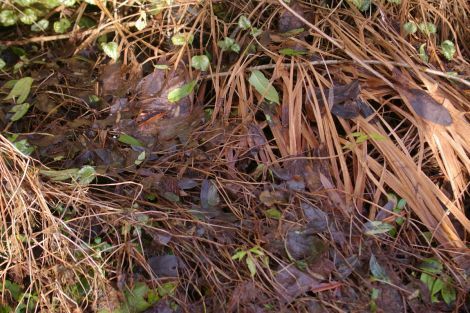 Winter wet is the enemy of a great many plants, and responsible for far more deaths in the garden than wind and salt-spray combined. For trees the combination of wet and wind can prove fatal. The hole left where the blackthorn’s root plate had once been was brimful with brown water – in a part of the garden I had hitherto considered to be reasonably well-drained. I blame the iron pan – the hard, rusty-red layer which forms between subsoil and topsoil in many Shetland gardens. Roots, even the strongest tree roots, can’t penetrate it. All they can do is grow sideways and if this progress is hampered by other tree roots in the vicinity, as is the case here, they can get blown over. Willows have suffered from a bad press in Shetland, because they allegedly “fall over”. A great many willows are tolerant of wet soil and temporary waterlogging and the reason for some toppling over lies elsewhere. It lies with the gardener. 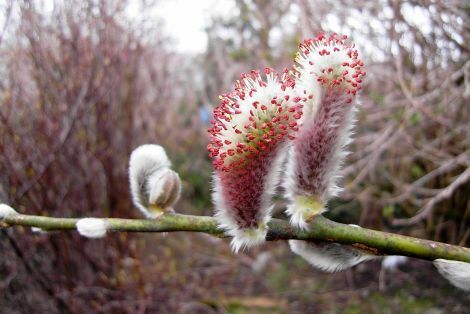 The quickest way to raise willows is from hardwood cuttings (now is a good time). They root quickly and are capable of putting on an inordinate amount of top-growth in their first season. It’s the nature of gardeners, myself included, to believe they know what’s best for them and their plants. And what gardener in their right mind would chop up their young willows, ending up with a pathetic little stump instead of an instant six-footer? The wise gardener would. In a wet and windy climate a strong root system is a top priority, and coppicing that young willow in its first spring to allow the root system to catch up, will guarantee it a long and vertical life. But there is yet another reason for trees to fall over, often many years after planting, as happened to the tallest tree at Lea Gardens – a magnificent eucalyptus specimen. Thanks to wide-spread pot culture we can now plant trees all through the growing season. We don’t have to wait until the ground thaws out or dries up. We don’t have to use our powers of visualisation when faced with a few bare sticks and a hole in the ground during the off-season. We can plant trees in full leaf and in flower when we choose to and can afford to do so. Trees aren’t meant to grow in containers, however large, and can only do so without detriment for a short span of time. The exception is the grey-white, woven, two-handled tree “bag”. Its colour light-prunes the roots and forces them to grow downwards. Dark-coloured pots do the opposite, they cause roots to spread out horizontally and, as they have nowhere to go, start spiralling, round and round and round. This spiralling, unless remedied, continues after the tree has been planted, ending in what’s called ‘self-strangulation’. Gardeners are scared of cutting through roots, which is understandable. Are we not told, from the earliest days of our long apprenticeships, not to disturb, let alone injure roots? Roots, just like top growth, have a remarkable capacity for re-growth. The recommended teasing out of the root-ball only brings satisfactory results in the very early stages of being “pot-bound”, and that was what caused my splendid eucalyptus to topple over eventually. Hopelessly spiralling subjects need surgery, and a drastically reduced root system means top growth must be reduced accordingly, removing all flowers and a good proportion of young, leafy growth. This rather defeats the purpose of the “instant impact” pot-grown tree. Cell-grown (no spiralling) or field-grown (bare-rooted) trees are your best bet. The former can be planted any time and the latter during their dormant season. I hate the term “bare-rooted” and advise all my readers never to buy trees that sit – often for weeks on end – in plastic sacks. Their roots either dry out or – this is a hideous practice – sit in shallow water, which gradually kills them off. Always buy your trees from a nursery or garden centre that keeps field-grown trees planted at a slant in shallow trenches (known as heeling in), so roots have good soil contact. Plant them as soon as possible or keep them heeled in yourself until you and your garden are ready. Regarding this dreadful winter, there are – how could it be otherwise – dissenting voices: those who have pronounced it a “good” one due to the absence of ice and snow. I beg to differ. 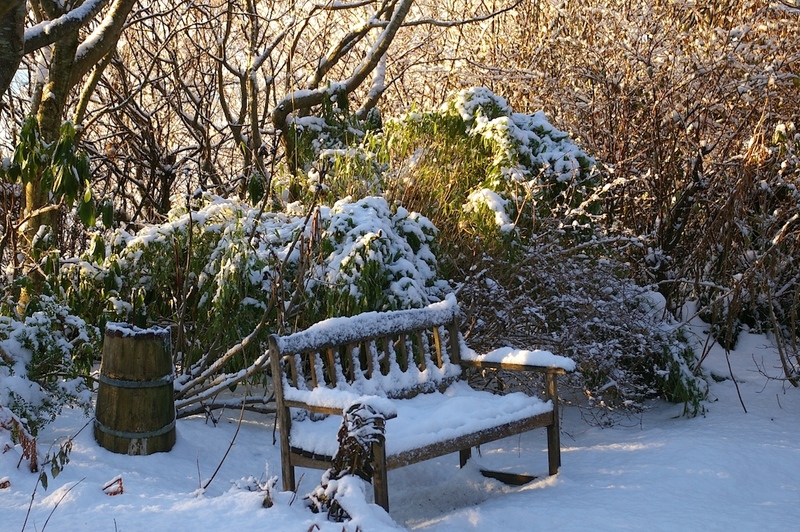 I would’ve liked some freezing temperatures and a long snowy spell, rather than a season of sad stumps, piles of exotic timber, soggy borders and squelchy lawns. I’ll be glad to (hopefully) see the back of this winter soon, but feel nostalgic for the real thing, looking at pictures of winters past, when snow turned the garden into a white fairytale.